This article’s goal is to provide valuable information on why and where to use entrance way matting to maintain and keep hardwood floors cleaner for a longer period of time while reducing wear and damage to the hardwood floor. 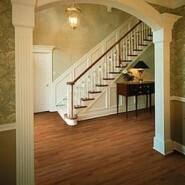 Additionally it will also cover other areas of the hardwood floor that would benefit from area rugs or carpet runners. This area of preventive maintenance is often overlooked but it is a critical part of how to clean hardwood floors. In fact it is every bit of important as the actual cleaning process of hardwood floors. Matting assists in protecting against excessive water and loose debris (sand) that can seriously damage to both the floor finish coating and the actual hardwood floor. If you were looking for detailed cleaning procedural processes; visit a prior article on procedures for commercial buildings to how to clean hardwood floors (How to Clean Hardwood Floors – Simple Regular Cleaning) or for residential homes to how to clean hardwood floors see this article (Wood Floor Cleaning – Procedure Cleaning Steps For Residential). Entrance Matting: Use entrance matting at all doorways both on the outside of the entrance doorway and on the inside of the doorway. Doing so will trap loose soils like sand, grit, dust, etc and prevent the soils from getting on the hardwood floors. It will also blot or soak up excessive water from shoes. This is especially important in winter months in those areas affected by inclement weather. Outside of Doorway: The best type of entrance matting to use is a scraper type such as the 3M Nomad Scraper Matting or a similar product. The scraper action created from the vinyl coated non-woven fibers does the best job of removing and trapping loose soils such as sand, salt, grit, dust, gravel, etc. from shoe bottoms. This type of matting leaves the loose soils outside of the building or home where it cannot damage the hardwood floor. Inside of Doorway: The best type for blotting or soaking excessive water from shoe bottoms before entering the hardwood floor is carpet type matting. This type of matting will assist in keeping water from the hardwood floor and any loose soil and debris that was missed by the outside entryway matting. Carpet Runners or Area Rugs: For commercial or residential buildings, using carpet runners or area rugs in high traffic areas of a hardwood floor will help keep clean the hardwood floor clean and protect the wood floor from damage from the wear and tear of foot traffic including preventing high heel shoes from damaging the floor. Vacuuming Non-Removable Matting: On a regular or even daily basis, vacuum all carpet or blotter type entrance matting, carpet runners and area rugs to remove the trapped loose debris like sand and grit. This will prevent the matting and carpet from getting overloaded. Once overloaded with loose soil, the soil will be tracked onto the hardwood flooring which will scratch and damage the seal and possibly the hardwood floor itself. Shake-Out Removable Matting: On a regular of even a daily basis, remove scraper, carpet or blotter type entrance matting, carpet runners and area rugs to be cleaned of their loose soil by rolling or folding the mat and shaking them outside or in an area of the building where it can be shaken out and then easily picked up by broom or vacuum. Removable Matting: Scraper Type can be cleaned through low pressure cleaning with a detergent; Carpet type mats can be cleaned through carpet extraction/shampoo or sent out to a mat rental service for cleaning. Non-Removable Matting: Carpet Extraction of carpet or blotter type matting is the recommended wet cleaning process to remove adhered soil or wet soil from the matting or carpet runners.